I recently saw Gerrit Dou's Dog at Rest at the MFA, to which it's been pledged. (It was charming watching people's faces light up as they noticed the piece walking through the room.) It struck me that it was the oldest (1650) "portrait" of a dog I was aware of. Of course, dogs appear in earlier landscapes, and as companions in portraits that are of humans (or, at least, so the humans think). But I couldn't think of an earlier painting in which the dog is clearly the subject. Is anyone familiar with an earlier one? If so, please post a link to the good boy/girl! N.B. : I know that free-standing statuary of dogs and use of dogs as a decorative motif on architecture, vases, sculpture, etc. goes back literally thousands of years. I'm talking about paintings, and the equivalent of portraits specifically. this is a mosaic, not a painting, but I’d argue it’s definitely a portrait. Guilty dog from Alexandria, 2nd century . Two Salukis, Zhu Zhanji (the Xuande Emperor), around 1427-1428. It's not an oil painting, of course, but it definitely seems like a painting specifically of these two dogs and not just an incidental appearance. There may be even earlier ones from China, but I happened to be familiar with that one. If mosaics are OK, then this one from ca. 150 AD, perhaps? Taken from this Ancient Art podcast transcription, which you may appreciate. Awww, excellent doggos all. Bq, even though it doesn't quite fit my category, I was especially glad to be reminded of that charming mosaic, which I'd seen before but forgotten about. This question was asked and answered prior to the publication of Pre-Neolithic evidence for dog-assisted hunting strategies in Arabia, which dates dog-related cave art at three sites to 5000-8000 BC. 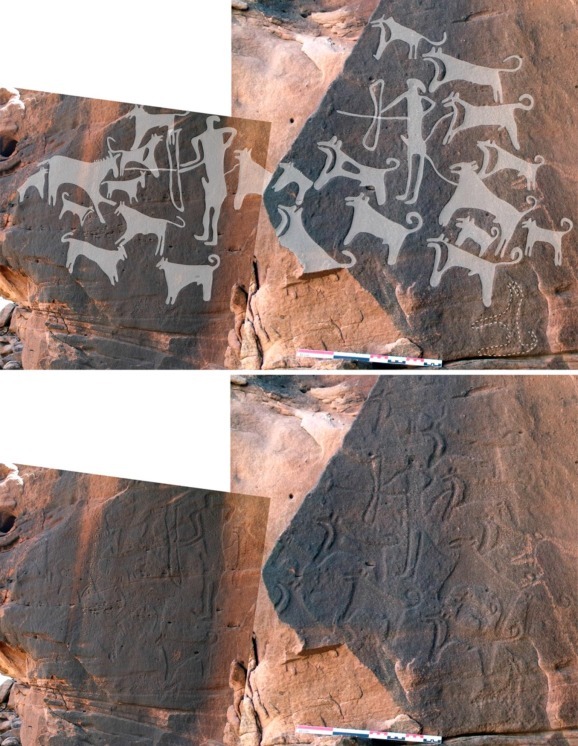 One figure, also in this news story, depicts two hunters (with bows, arrows, and erections) and twenty-one dogs interacting with some sort of horse. Most interestingly, some of the earliest of the dog images also appear to show leashes. I see that your question asks specifically about paintings/portraits, rather than dogs as a decorative motif. However, these rock engravings seem to predate paintings (at least in that part of the world). And the paper goes into some detail about marks on the dog depictions and their similarity to white marks commonly found on the shoulders and chests of "Canaan dogs" found in the region today.